Do you ever just not want to do something? You put it off, and hesitate, and find anything and everything else to keep from doing the one thing you just can’t bring yourself to do? I was notorious for this in college. Around finals time, my house would be spotless because I’d much rather clean than study. A big paper due this week? I’ll just do all my laundry while I read over my notes. Oh, since I’m down here in the kitchen, I might as well start something for dinner. Now that dinner’s over, it’s time to wash every dish we own. Oh my laundry’s done. Well, now I have to fold everything and put it away. What? It’s midnight already? But I haven’t even started! Oh well. I’ll get to it tomorrow. And I’d start the whole process over the next day, finding bathrooms to clean and closets to rearrange, until finally, the night before the paper was due, I’d be busting out 15 pages at 3am, just praying I’d get it done in time for my 8am class, and cursing myself for waiting so long. Well, here I am, almost 10 years later, still doing it. Meet my 15 page paper that was due last week. 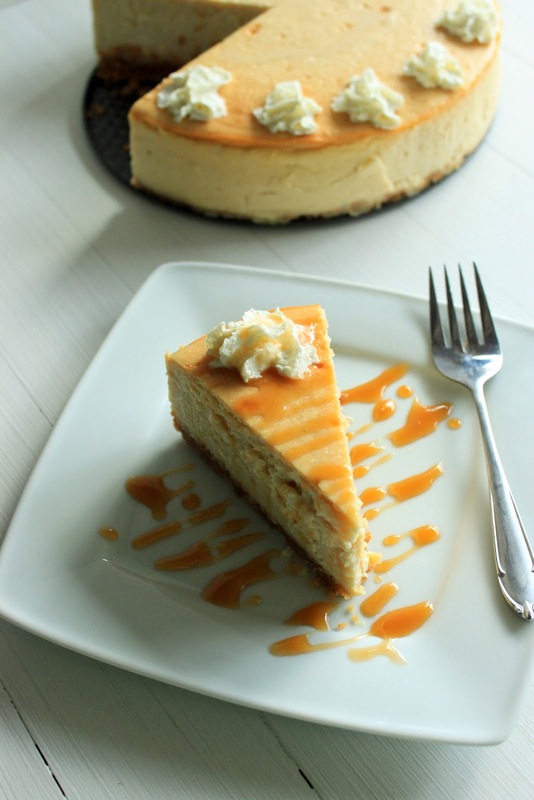 Bailey’s Irish Cream Cheesecake. The perfect dessert to celebrate St. Patrick’s Day. If you get it done in time. I had every intention of making this well before St. Patty’s Day. I had all the ingredients. I had everything planned out. And I avoided it like the Plague. I have a bit of a rocky relationship with cheesecake. We’ve never really seen eye to eye. I want a beautiful, creamy, delicious dessert. Cheesecake wants to crack like the Grand Canyon, no matter how many tips I try to keep it from happening. Water bath? Yep. Room temperature ingredients? Check. Turn the heat up then down? Done it. I’ve left the oven door closed while cooling. I’ve left it cracked. 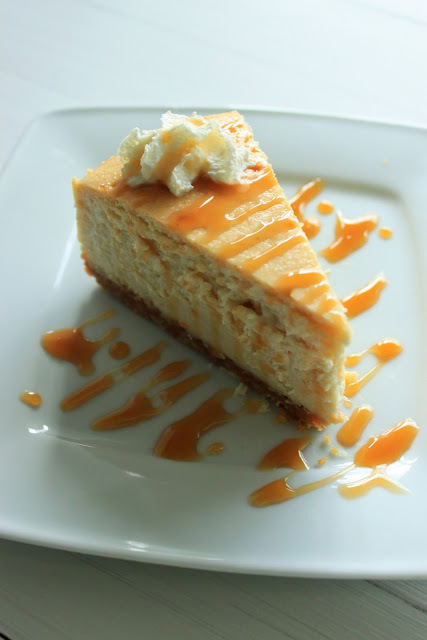 Short of a cheesecake rain dance, I’ve tried it all—to no avail. So I reeeeally didn’t want to make it, because I knew I’d just end up disappointed again. But finally, I sucked it up and said, “Just do the damn thing. Get it over with.” So, even though it was already too late to post in time for the holiday, I did it. And guess what. Not a single crack! Not even a tiny one! Other than a couple air bubble dimples, the top was perfectly smooth!! It was a St. Patrick’s Day cheesecake miracle! I’m not sure what tip ended up being the deal breaker, if it was the combination of all, or whether I just had the Luck of the Irish that day, but it actually, for the first time ever, turned out perfectly! And it tasted pretty darn good too. Totally creamy with just a hint of Bailey’s. I’m not even ashamed to admit that I ate a piece for dinner one night. So these are all the tricks I used to create a perfect cheesecake. Not sure if any or all of them are the reason it didn’t crack, but I’m definitely trying all of them again next time to see if it really is fail proof or just a fluke! - Room temperature ingredients: I let everything sit out on the counter overnight to make sure there was no chill at all on them. - Jayme of Delectable Deliciousness used a tablespoon of cornstarch to help it stay together. - Jamie from My Baking Addiction suggested putting the springform pan in an oven bag to ensure no water gets in. I’ve had these turkey sized oven bags in my pantry for YEARS, so I tried it, and with the bag protecting the pan, I was able to bring the water bath higher up the sides than I would with just foil. - I turned the oven off and let it cool, without opening the door at all, for exactly an hour. Then I took it out and set it on the counter. I ran a sharp knife along the edge to loosen it from the pan so it wouldn’t stick, then let it cool until it was just barely warm to the touch on the bottom before putting it in the fridge to chill overnight. *Note: If you don’t have a vanilla bean, increase the vanilla extract to 1 tablespoon. 4. Press crumbs into the bottom of your pan, and if you desire, 1 inch up the sides as well. Press down with your hand or the bottom of a glass to compact the crumbs. Bake for 7 minutes. Remove from oven and cool completely on a wire rack. 6. Add cream cheese and cornstarch to the sugar mixture and beat until combined and smooth. Add eggs, one at a time, beating until combined and scraping down the side of the bowl as needed. Add heavy cream, Bailey’s Irish Cream, and vanilla to cream cheese mixture, and beat until smooth and well combined. 7. Pour batter into prepared crust. Smooth the top and smack on the counter a few times to release any air bubbles. Place pan into a large roasting pan, and pour boiling water into the larger pan until the water reaches halfway up the sides of the springform pan. 8. Bake 45 to 55 minutes, or until the edges are set, but the center still jiggles when shaken. Turn the heat off, and let the cheesecake rest in the oven with the door closed for 1 hour. 9. After an hour, remove cheesecake from oven and water bath and place on a wire rack. 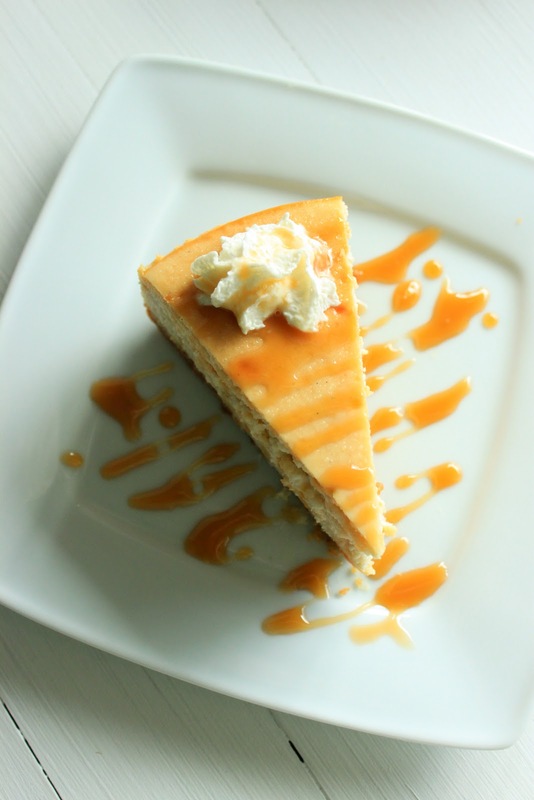 Run a sharp knife around the edge of the cheesecake to loosen from the sides of the pan. Allow to cool on wire rack completely before placing in the refrigerator to chill for at least 5 hours, up to overnight. 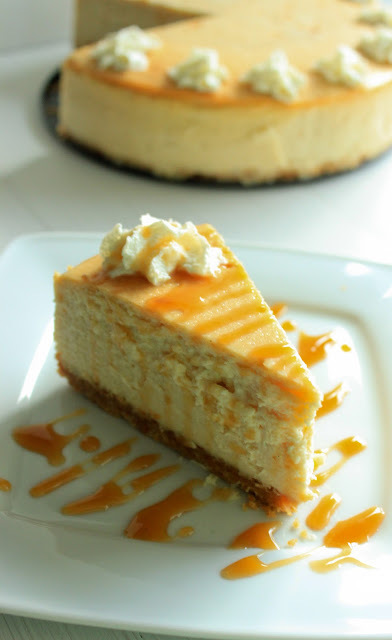 Another tip ithat I've read about s to place a bowl/dish of water in the oven under the cheesecake?